I've been tagged by my very talented friend Michelle: the tag is to take part in the 6 by 6 game. Rules: choose the sixth image out of your sixth picture folder from your computer and blog it. Then tag six more people to do the same. This photo is from the kitchen in my Louisville, KY, relocation rental apartment I lived in for 9 weeks in spring, 2008. It was given a fake tilt-shift treatment, thus making the thing look like a model (not my best work). There are other examples of this treatment in my Etsy shop that are much better - like Toy Boats, Toy Boats, Toy Boats for example! I am going to drop the ball here and not tag anyone else. If you feel so inclined to play the game, please post in my comments that you did it so we can all go check it out - but the choice is yours! You leave so much unanswered! Louisville? Relocation? Inquiring minds want to know! I wanted to do this a while back but I went to the 6th of the 6th and there were 10 folders in that one. I was not gong for another 6th if you know what I mean lol. 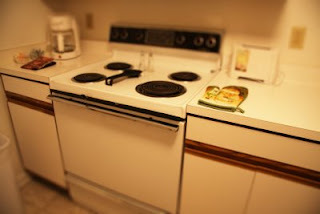 I think this one is cool, the stove looks "teeny"
Suldog, guess we were not reading each other's blogs last year. From around Easter through the end of May, I was living in Louisville, KY, while working on a contract IT assignment there. I believe I made about 16 posts in all relative to this temporary "relocation". judi, i love this effect! the "toy boats" photo on etsy is just fantastic. i'd love to know how you did this!